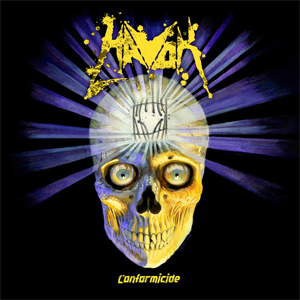 Colorado based thrash metal outfit HAVOK are disseminating the first new track off their upcoming album, Conformicide. The song, titled "Hang 'Em High" can be heard via the lyric video below and is the first instant grat track for those who pre-order the album on Amazon and iTunes. Conformicide will see a March 10th release on Century Media Records. Speaking about the message behind "Hang 'Em High" and the accompanying lyric video, David Sanchez (lead vocals, guitar) comments, "In our current political atmosphere, corruption runs deep. This is our response. It's time to wake up." In addition to Conformicide being released on CD, digital and streaming platforms, the album will also be available in an array of limited edition vinyl colors. See below for a complete list of these color LPs and where fans can purchase them. In the shop for almost three years, HAVOK’s Conformicide is undoubtedly their Master Of Puppets or Rust In Peace moment. While it's true that the Denver-based rippers have bled out guts, brains, and cash on previous records like Unnatural Selection (2013), Time Is Up (2011), and Burn (2009), none of them compare to the ear-destroying, mind-flaying upheavel heard on Conformicide. 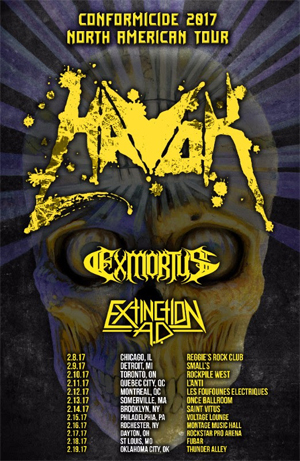 HAVOK are preparing to embark on their first headlining tour of the year in North America as part of the build up to Conformicide. Immediately following this run, the band will join on as part of the "World Gone Mad" tour, supporting the legendary likes of SUICIDAL TENDENCIES and CROWBAR. A complete list of dates for both tours can be found below. HAVOK will be in attendance at this weekend's convention as part of the Peavey family. On Saturday, David Sanchez and Reece Scruggs will be participating in a fan signing at 3:30pm, followed by a live performance on the Peavey stage at 5:00pm. North American Headlining Tour w/EXMORTUS & EXTINCTION A.D.